A photographer friend of ours, Julio, was in town recently from Portugal. 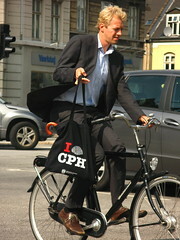 Here's his take on Copenhagen Cycle Chic. Always wonderful to see someone elses angle on our fair city. 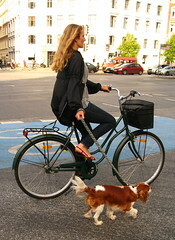 A determined stride is a trademark of a Copenhagener, when not on the bike. A casual glance at the mobile. Either checking for text messages or checking the time. Bring a friend for a ride/walk.